I am one of the first athletes, starting back in 2008, to begin wearing, testing, and promoting the value of graduated compression socks for any athletic activity. Increased blood flow and injury prevention are very important for me as an older athlete. Increased blood flow means more oxygen and nutrients and less lactic acid build up. Injury prevention means greater protection to the muscles, ligaments, and tendons by reducing the vibration with increased support. My sock of choice is the Sigvaris Performance socks (www.sigvaris.com) that are real graduated compression (many companies claim their socks are but fail in our testing) and go from the tip of your toes to above the calf. 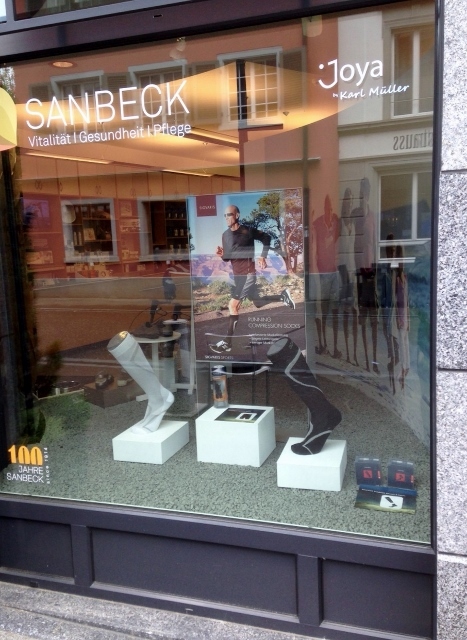 This above photo is from the store Sanbeck AG, Winterthur, Switzerland (https://www.sanbeck.ch/) is part of Sigvaris’ European promotions displaying their Performance line of socks. Sigvaris takes their extensive medical background and brings it to the athletic arena. I believe that Sigvaris is the best Performance sock on the worldwide market. I am wearing them in every one of my athletic events from running to tennis. Sometimes I forget how the graduated compression socks help my legs feel so good. All I need to do is to wear an ordinary polyester sock on a run and I really feel the difference in performance and recovery. I used Sigvaris Performance socks in every race this summer in Greece. I am not a big advocate of the sport sleeves that are seen at many sporting events. The sleeves might be practical and easy as you can still wear your ankle height socks and wear the sleeve above them, but the science to me does not make sense. If you can imagine the graduated compression sock like a tube of toothpaste pushing the paste upwards. Even though the compression is greater at the ankle and decreases as you go up the calf, why would you not want to include the foot? I want the blood in the foot to be part of the process. I feel the difference in the effectiveness between the sock and the sleeve. I wear the performance graduated compression sock before my event for blood flow on the way to the competition, at every event for performance, post event for recovery, and in my travels as my lower extremities can swell especially on flights. Give the Sigvaris Performance Socks a try to see if they make a difference in your next race. Posted in - My Daily Journal, Author - David O'Meara, Topic - Equipment.